The Colebrook equation is only valid at turbulent flow conditions. Note! - the friction coefficient is involved on both sides of the equation. The equation must therefore be solved by iteration. 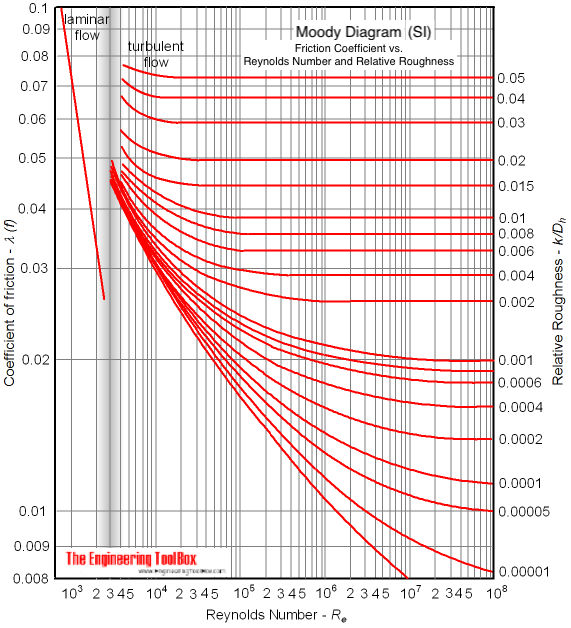 The Colebrook equation is generic and can be used to calculate friction coefficients for different kinds of fluid flows - like air ventilation ducts, pipes and tubes with water or oil, compressed air and much more. The friction coefficient can be calculated with the online Colebrook calculator below. The default values used are for turbulent air flow in a 315 mm duct with 6 m/s (0.47 m3/s). The kinematic viscosity used to calculate the Reynolds Number is 15 10-6 m2/s. Replace the parameters with the appropriate values for your application. The calculator below can be used to calculate the friction coefficient if velocity and kinematic viscosity of the fluid are known. Engineering ToolBox, (2008). Colebrook Equation. [online] Available at: https://www.engineeringtoolbox.com/colebrook-equation-d_1031.html [Accessed Day Mo. Year].